In this video, Mark Donovan of HomeAdditionPlus.com discusses circuit breakers in home electrical wiring. 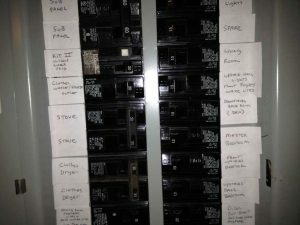 Circuit breakers play a significant role in protecting your home from fire. When too much current flows through a wire the wire gets hot. If allowed to continue the wire could get so hot that a fire is started. A circuit breaker senses the increase in current and stops the flow of power to the circuit, thus preventing the threat of fire.